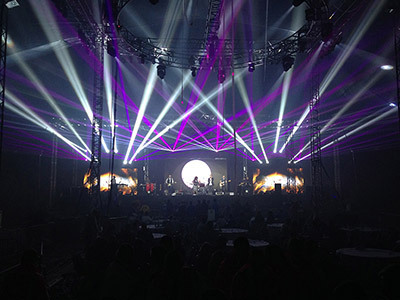 At Giorgio Labbate Productions, we have everything to ensure that your event is executed to the very best level in terms of sound and lighting. From PA systems and sound equipment hire for bands and DJs, to starlit, black, white or LED dance floors and lighting; we’re here to ensure your wedding, corporate event or private party makes an impact for all the right reasons. 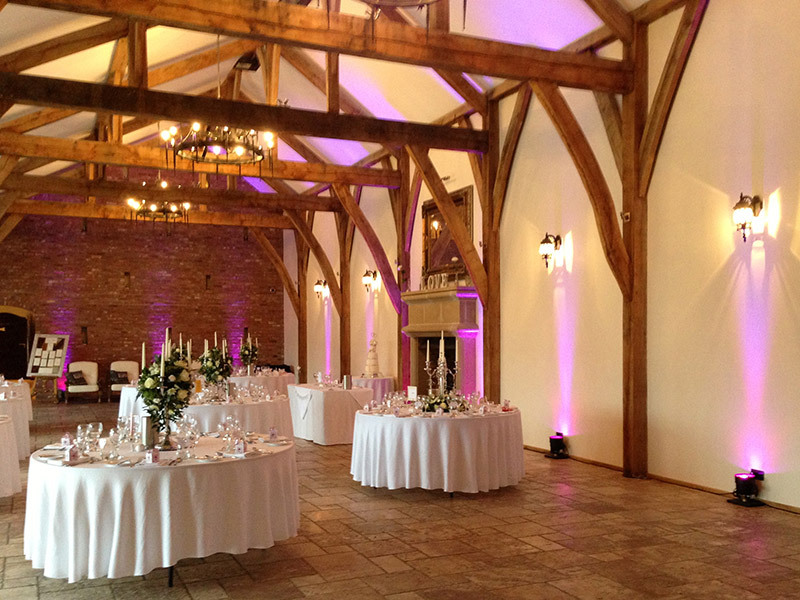 Covering the whole East Midlands region including Nottingham, Derby, Leicester and beyond, no event is too big or too small for us to manage and your satisfaction is paramount. We have a reputation for excellent customer service, courtesy and professionalism. We work closely with bands and DJs, so if you’re interested in booking one of our services and would also like some recommendations on live entertainment, give us a call and we’ll be happy to assist you. 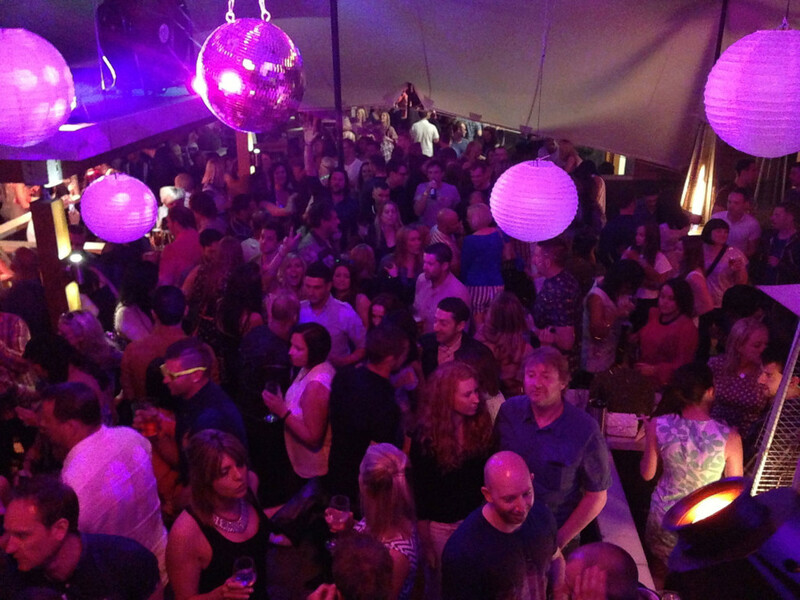 We take pride in your event and guarantee that it will be produced to the highest standard, at a sensible price. But don’t just take our word for it, have a look at some of our client testimonials. We know what it means to create a great impression, that’s why we’re the first port of call for corporate event productions in the East Midlands. The best day of your life should be without technical hiccups. With us on board, great sound and lighting will be one less thing to worry about. When you need to be heard, we can provide indoor and outdoor PA and sound systems for any type of event. Are you a band or DJ or just looking for one? 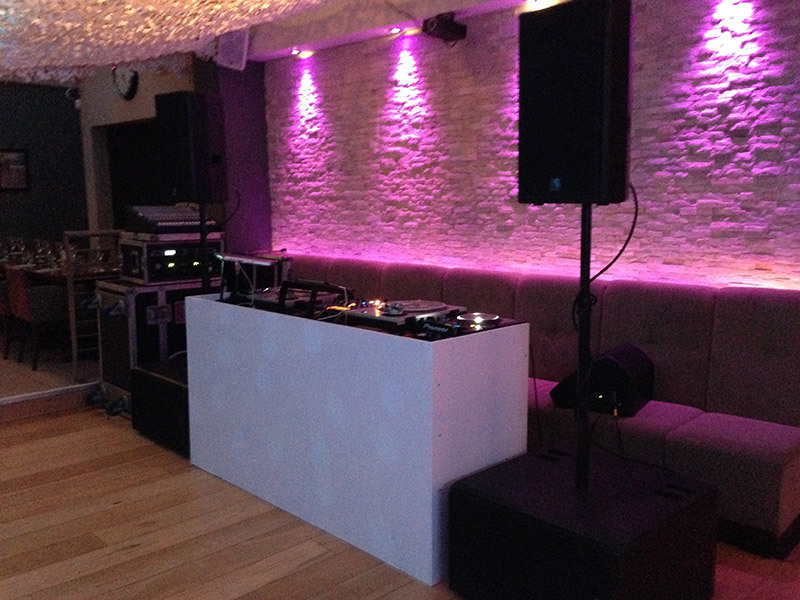 We can supply sound systems and audio equipment to suit professional needs; and even the acts themselves. Hear from our extremely satisfied customers! Giorgio has set up and managed the sound and light for many of our groups events including our Pop Up Parties, liaising with top international DJs, small outside festival stage with multiple artists and live band gigs. He always works well with me and private clients listening closely to the brief and delivering excellent results. I would highly recommend his services. One of the last wedding planning decisions that Cheryl and I made was to hire a dance floor from Giorgio at Giorgio Labbate Productions. With hindsight it was one of the best decisions, if we were to have a re-do it would be one of the first things we would book. 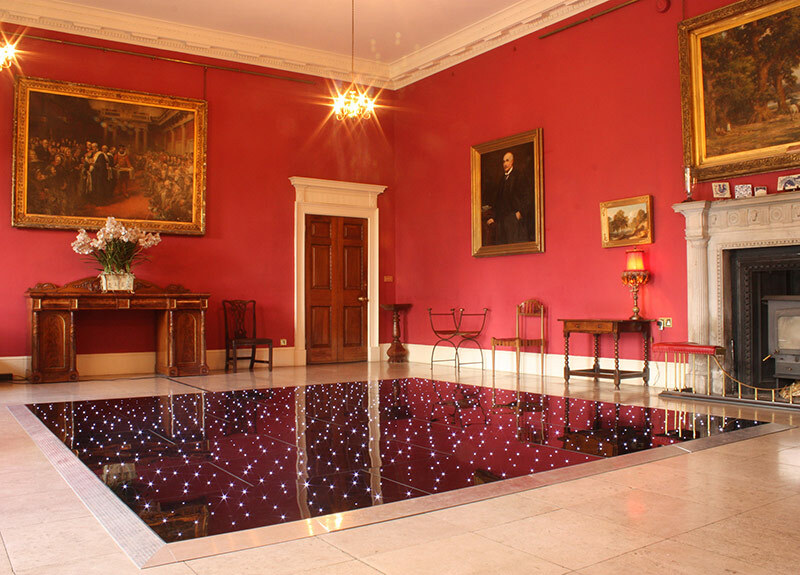 The floor looked stunning, lit up the room and had a hypnotic effect that made even the more introverted guests want to have a go! Giorgio and his team were consummate professionals, on time, hassle-free and completely accommodating to our and the venue’s needs. I believe the dance floor made the night and would go so far as to say that a wedding without one isn’t nearly as much fun as one that has one! 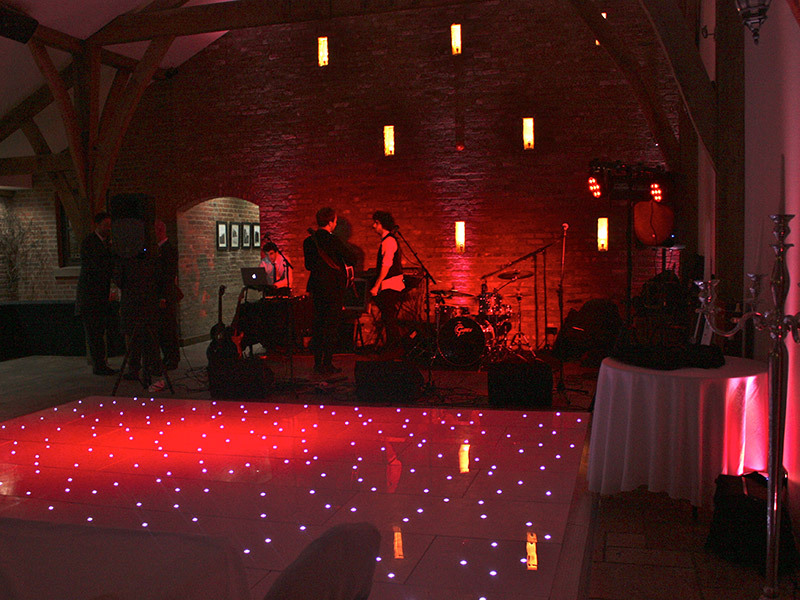 Thank you very much for providing the black starlit dance floor for our wedding evening reception last Saturday. Everybody (and I mean everybody!) commented on how wonderful the dance floor was. We’ve seen some of the guests photos and they look amazing so I can only imagine how good the photographers photos will be. I’ll be sure to keep you in mind if anyone I know is looking for the services you offer in the future. Giorgio’s service was incredibly professional and efficient. He offered great advice to meet our requirements and helped make our day stress free. The equipment all looked and sounded great. I will use his services again and highly recommend him to others. 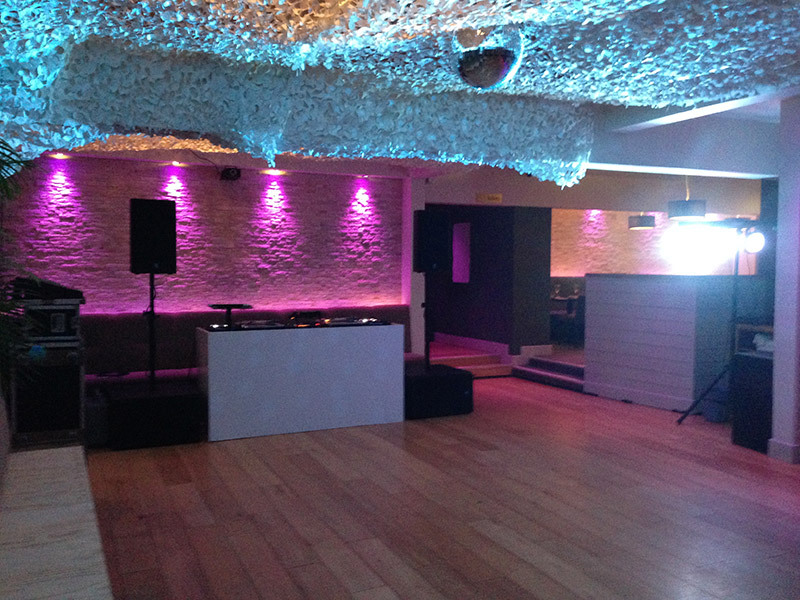 Just a note to say a huge thank you for sorting out the dance floor for my 40th celebrations. It looked fantastic and really finished the room off to perfection. My guests and I loved it! Thanks again. Giorgio is a very talented and competent Sound Engineer. He is very easy to work with and his knowledge of his trade is second to none. He is always on time and will never let you down, and you can always count on him to get the job done to a very high standard. I have worked with him for years and will happily keep hiring him for many more. Yes you will receive a Contract confirming your booking and all the relevant details. Will there be a deposit to pay? Yes, a percentage of the fee is payable on agreement of the booking. What system do I require for my event? If you are not sure on what system you require to make your event a success we are happy to advise you so please feel free to contact us via the contact page or give us a call. This depends on what services you require and can be discussed in more detail upon booking. Do you supply cables with equipment hired from you? All packages hired from us will come with necessary cabling – if there are any special requirements please ask. Do you offer a discount for longer hires? Can you deliver, set up and collect equipment? Yes at a small cost. The delivery address will be required when booking to ensure an accurate quotation. Can I hire equipment for tonight? Give us a call we will try and help where ever we can, however the more notice the better. Please contact us and we will be happy to send them over. What is required when ‘Dry Hiring’ Equipment? We will require a deposit to secure your booking and a damage deposit on delivery or collection and 2 forms of ID. Bank Transfer or credit card or cash. I can’t find what piece of equipment I want to hire? Please get in touch if we can’t help the chances are we will know someone who can. Just call us and we will assist you. I need additional equipment, can you help? Yes, of course we will do our best to supply everything you need, so if you have any specific requirements please contact us. What if my event needs to go on longer than agreed? This may not a problem within reason, however an addition cost could be incurred. We can provide a solution suited to your specific needs – whether it’s a small PA system for a conference or a larger system for an outdoor event. 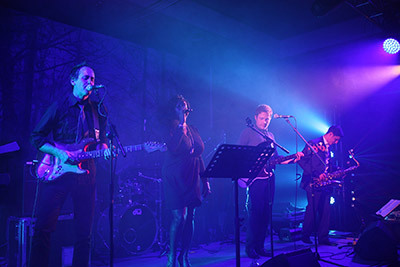 We stock a range of equipment and it’s all scalable – we have the solution to suit the size and location of your event. Whether you need to hire a small PA system and microphones for a conference; background music for a wedding or party; or a larger system to accommodate a band outdoors, we can take care of it. Whatever you need or even if you’re not sure, just give us a call. We appreciate that not everyone’s an expert, so we’re happy to give advice! We have equipment available for both wet and dry hire. Say it Loud. Say it Clear. Say it Proud. Focus on delivering your message and let us focus on making sure it’s seen and heard. With room ambience and top quality sound systems including wireless microphones you can interact without boundaries and create a buzz that will outshine any competition. Success depends upon making an impact and with a little help from Giorgio Labbate Productions, you can make your corporate event more impressive and memorable than ever. A Stunning Focal Point for Added Dimension. 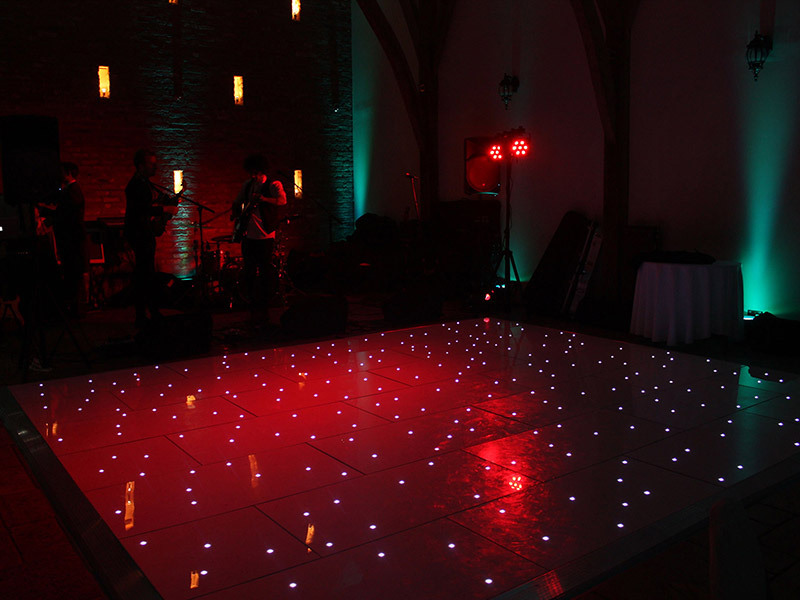 Our starlit LED black and white dance floors are a real showstopper. We can supply them in various shapes and sizes to fit your exact requirements. We also offer parquet dance floors and plain black and white. 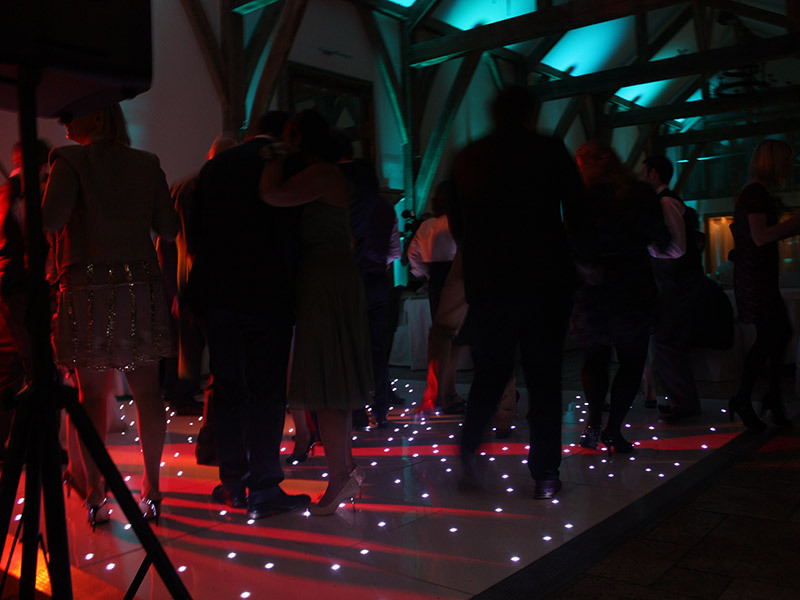 To complement your dance floor, why not include some mood lighting, a backdrop or a starlit DJ booth? 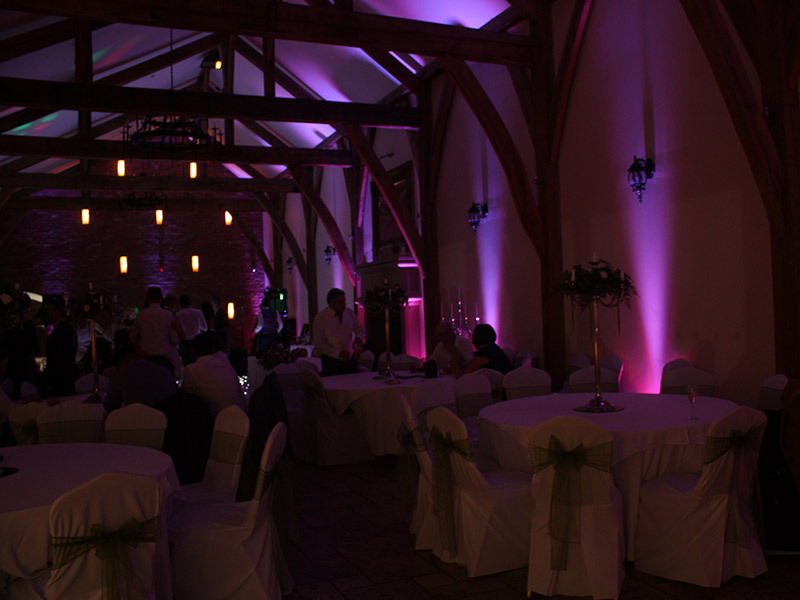 Our mood lighting and LED up-lighting can be hired as a stand-alone option or to complement our dance floors. It’s perfect for creating ambience and adding extra finesse and sophistication to your venue. It can be used to light up an entrance, bring interest to an alcove or simply enhance a room’s features and characteristics. If you think it will be impossible to uplight your space due to lack of power sockets or unwanted cables, this is not a problem for GL Productions – we can provide wireless battery powered uplighters which are also suitable for temporary outdoor use (subject to weather conditions). The batteries have a 12 hour life span so will last throughout your event. The lighting can be set to a static colour during the day and fade through a spectrum of colours in the evening. You can even use the lighting’s ‘sound to light’ setting and have the lights react to the music as your evening comes alive! At Giorgio Labbate Productions, we understand the pressure you’re under to have a wedding or party to remember – for all the right reasons. 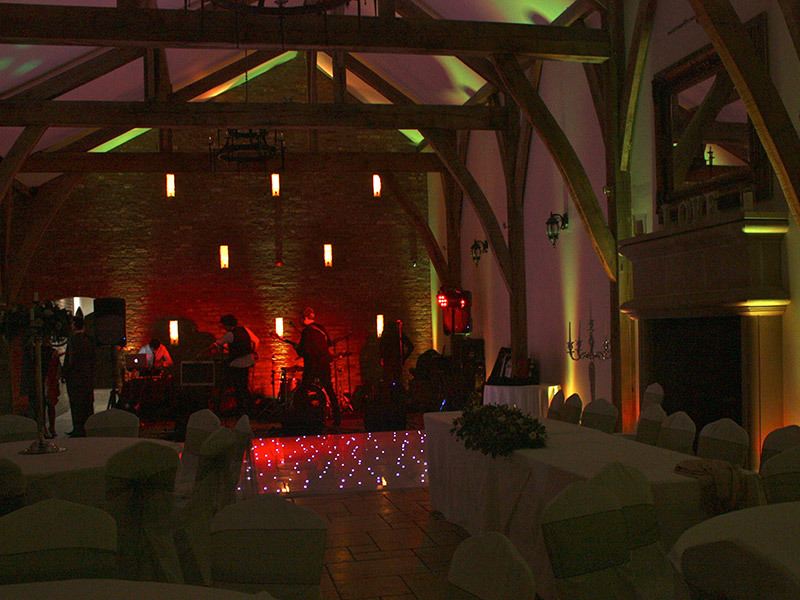 From daytime drapes to evening entertainment, we can provide the very best in occasion lighting, sound systems and even DJs and bands to keep feet on the dance floor ’til the early hours. We work with our sleeves up and our ears to the ground, analysing the individual requirements in detail and making sure we have a clear understanding of each venue or location. If required we can include a preliminary visit to the venue before advising on the best equipment to really bring out the fun factor of the occasion. Our attention to detail means that the technical details of your occasion can be one less thing to worry about. If you know what you’re looking for or just need some inspiration or advice, Giorgio Labbate Productions can guide you in the right direction. Just pick up the phone and we’ll be happy to talk it through.